After the closure of the racecourse at Four Oaks Park in 1889, Four Oaks Hall and its park were purchased by Lord Clanricarde. The purchase of Four Oaks Hall was a purely business transaction, done with a view to making a profit, and his agents soon set out Hartopp Road, Luttrell Road, Ladywood Road, Wentworth Road and Bracebridge Road with a view to selling the land off for building, and Four Oaks Hall was demolished in 1898. Sites adjoining Sutton Park were some of the first to be developed, some as large as eight acres. By 1901 fifteen prestigious houses had been built along Hartopp Road backing on to the park, many of them for successful Birmingham businessmen. There were two jewellers, Job Coles in a relatively modest house near Hartopp Gate with his wife, two grown-up daughters and two servants, while a much larger property, “Ellangowan”, housed Arthur Owen, aged 37, with his wife, sister-in-law, four young children and four servants. Birmingham Gun manufacturer James Turner was at “The Rookery” with his grown-up family, next door to the much younger edge-tool maker William Heaton with his wife, baby and two servants at “Moorlands”. Also in the Birmingham metal trades were; at “The Gables”, Albert Hills, a 38-year-old steel maker, living alone with one servant; and at “Belmont” lived Emma Narborough, widow of a Birmingham metal manufacturer, her two daughters, and her son and son-in-law, both in the metal trades. Edward Titley, a retired Birmingham brewer lived at “Beechwood”, and another retired businessman, John Jones, director of a Birmingham furniture manufactory, lived at “Hartopp Grange” with his 64-year-old wife, four grown-up unmarried children and two servants. A Birmingham wholesale haberdasher, Sidney Taylor, lived at “Luttrell House”. There were also factory owners from nearby Walsall - buckle manufacturer Frederick Cotterell had “Nuthurst” and at “Closeburn” lived Vincent Kirkpatrick, 55 years old, a Walsall ironfounder with his wife, son-in-law, daughter and two servants. Walsall was a centre of saddle and harness making (there were over three million horses in Britain in 1900), and two successful Walsall saddlers had built houses in Hartopp Road. At “Hartopp Court” was George Martin, 51, with his wife, two children, his employee nephew, a housekeeper living in the lodge, and four servants, while at “Ladywood”, designed by Sir Edward Lutyens and perhaps the most prestigious house of all, lived 40-year old Frederick Rathbone, with his wife, three young children and five servants. (“Ladywood” was destroyed by fire in 1924). The professions were represented by two solicitors. Charles Matthews, a Birmingham solicitor was at “The Hurst” - his son had just got his university degree, his son’s friend was visiting, there were four servants and his coachman lived in the grounds at “Hurst Lodge”. 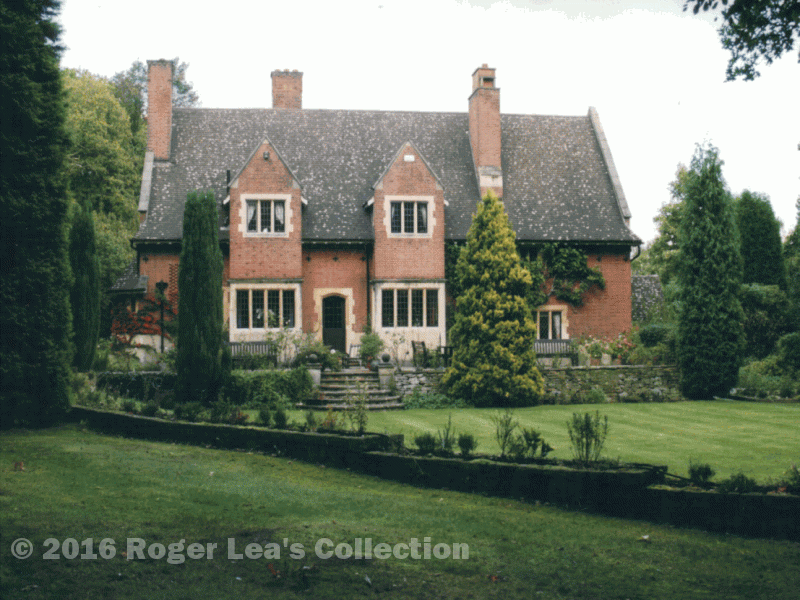 (“The Hurst”, now demolished, was designed by the architect W.S.Lethaby). Arthur Whitehead, a 31-year old solicitor lived at “Shillingford” with his young wife, baby daughter and three servants. The occupiers of the remaining house, “Briarwood”, set in its eight acres of pleasure grounds, were away in 1901, but in 1911 the managing director of Perry and Co. Ltd. Steel Pens, William Wiley lived there. Hartopp Road was a private road, maintained by the house owners, who had decided that street lighting was unnecessary. However, there were nineteen maids in the various houses, average age 24, whose job it was to collect the post every morning. When their masters became aware that on dark winter mornings the maids were terrified of walking along the pitch dark Hartopp Road, they relented from their original plan and installed street lighting. 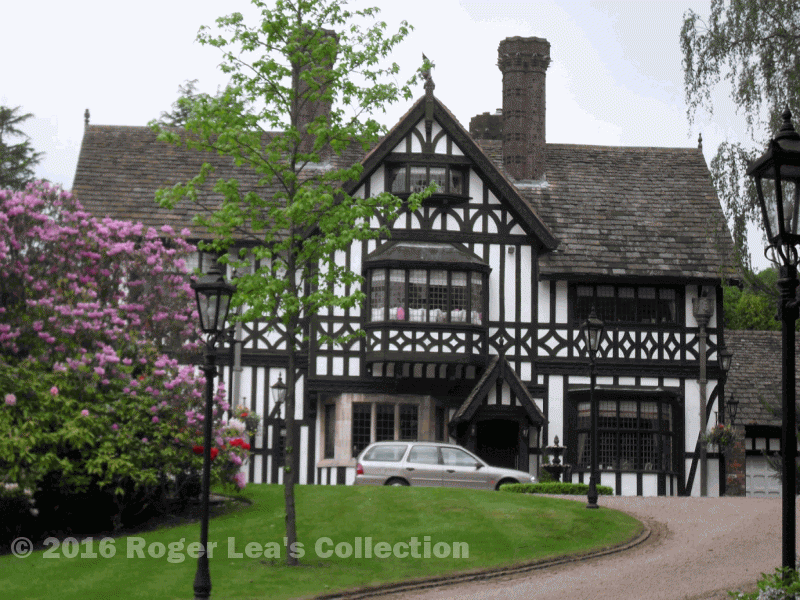 The more restrained arts-and-crafts style of “Woodgate”.